Many couples believe that they have a love story that matches the greatest love stories found in books and films. If you believe the story of your romance and marriage is captivating enough to charm audiences around the world and bring smiles and tears to people, you can showcase your love in the best possible manner with this wedding invitation. The Love Story wedding invitation card from Paper Themes is a simple one but it has a striking design that will grab the attention of everyone who looks at it. 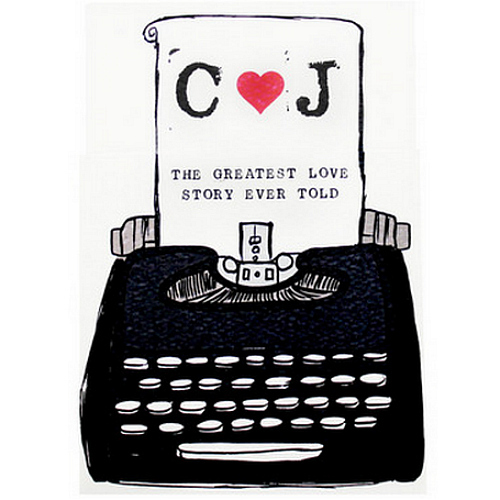 A bold typewriter sits with a sheet of a paper containing the initials of the happy couple, linked with a love heart and the subheading of “The Greatest Love Story Ever Told”. It is the sort of design that would make a tremendous cover for a book, but it also works ideally for any couple with a love for literature or who have a passion for romantic stories. The invitation comes with a Z-fold insert, allowing plenty of space for information and it all ties in neatly with the front page. If you are looking for a wedding invitation that fully buys into a theme, this is one that will ensure all of your guests know all about your love. 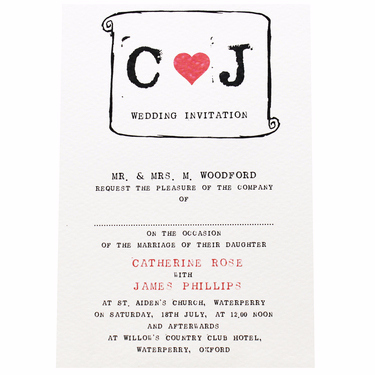 The simplistic nature of the wedding invitation means that it will be suitable for a broad range of wedding themes and colour schemes, and the romantic theme behind the design is sure to strike a chord with all of your guests. If you are keen to invite your friends, family and acquaintances to the biggest chapter in the story of your love, this stylish wedding invitation will be the perfect way to do so.